In a word: Southside of the border. JM ate the steak burrito. Nichole ate the taco sampler. The bill was $26, or $13/person, plus tip. JM and Nichole both gave Tapatios Cocina a B+ (see our grading rubric). Tapatios in Fitchburg really felt quite Fitchburg-y to us. It's in the same Cahill Main strip mall as the Great Dane and seems to be thinking: "What if people at the Great Dane wanted Mexican food?" This is not to say that Tapatios is bad or anything, just that it's more corporate-feeling than average. For example, the prices. 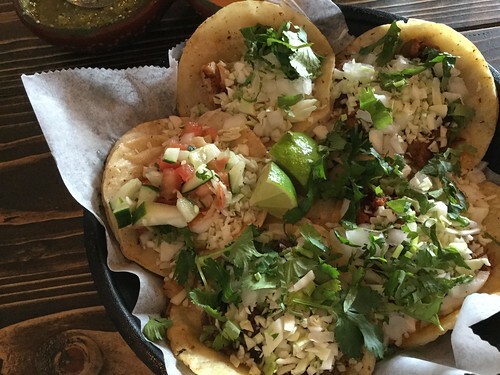 Tapatios is no taco truck or abarrotes spot, with lovingly prepared but ultimately cheap eats. Everything is bright and shiny in Fitchburg... like it's Madison's Tomorrowland ride. What is here, though, is pretty good nosh. Nichole dug the taco sampler (which is a great idea: one of each of the 3 or 4 most popular tacos at any given spot - here being al pastor, steak, beef, chicken and fish), particularly the ample veggies on each 3- or 4-bite taco. She followed it with a delicious guava cream cheese empanada from Caracas Empanadas, also three bites big. JM got his Mexistandard Steak Burrito and found this one tasty but a little light on his favorite parts. The salsa selection was very good. 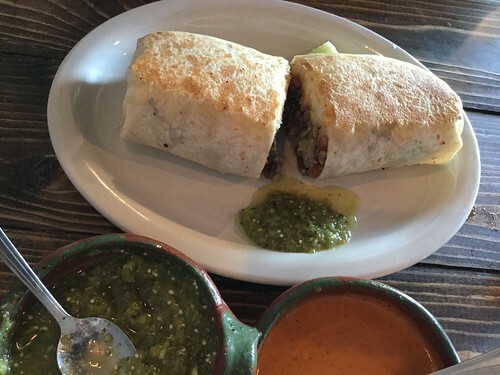 Ever since Casa de Lara became the Thirsty Goat, southside denizens and workers may need a place other than Laredo's to take the office lunch crowd, and Tapatios definitely fits that bill. 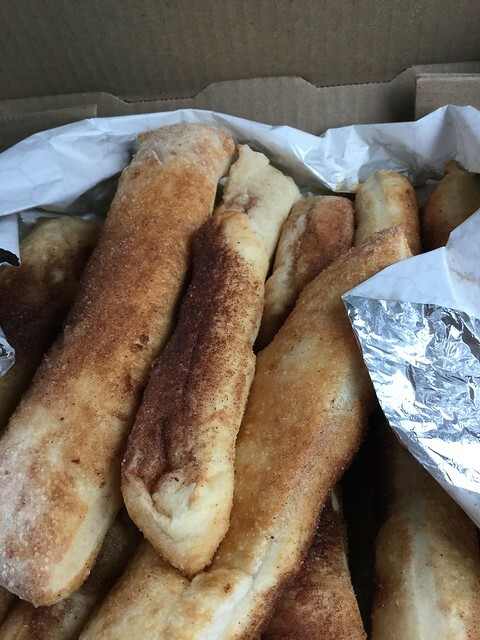 In a word: This bland is your bland. Chris ate the Wai-Kiki Chiki. 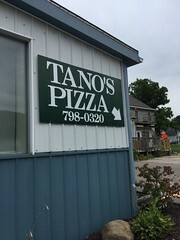 JM ate the Tano booga. Marissa ate the Southwest Turkey Sandwich. 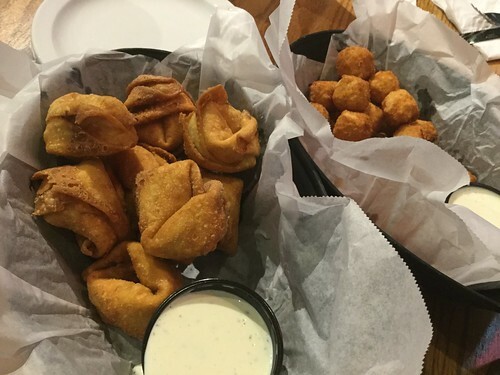 We split the jalapeño cheese balls and the buffalo chicken rangoon. JM and Chris gave Tanner's a B- ; Marissa gave Tanner's a C ; Nichole gave Tanner's a C+ (see our grading rubric). We went to Tanners on the 4th of July with some good friends. Therefore we got to try a lot of the different kinds, and different kinds of cutesy names, of things on the menu. Overall, Tanner's feels like one sports bar too many. 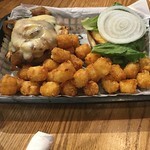 Our friends had visited Monk's with us as well and we all agreed that Tanner's offers a big "so what" in comparison (and it's literally 2 minutes away). So, what did we get? We started with the jalapeño cheese balls and the buffalo chicken rangoon. Probably we were feeling a little spicy. The fry medium at Tanner's is A-OK. These all came golden and delicious. Well, the balls were a little too much breading. The rangoon came as advertised, though we were mixed on whether we'd get them again. For sandwiches, there was the Wai-Kiki Chiki, which came with nice tots. It was tasty, but a little one-note on account of the whole bottle of teriyaki sauce spilled onto it. 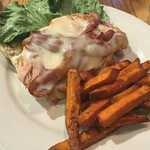 The Southwest Turkey Sandwich was OK, if a little underwhelming, and its accompanying sweet potato fries were a third generation of facsimile of the version that made people want them. The Tano booga was cooked well, though JM has an impossibly hard time calling a "burger" a "booga". 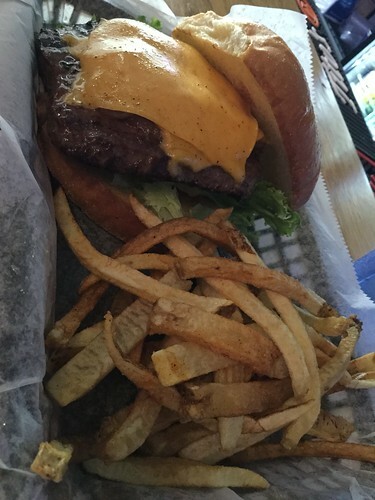 The cheese was almost melted to sauce level and the fries were fine. Nichole's ABLT was not great but not bad, how's that for equivocating. The cole slaw was also completely bland and lacking in interest. Many of us felt that our dishes were merely copies of better ideas other people had and brought to the menu because of customer expectation. Not a lot of innovation, just grudging acceptance, which is why we'd likely meet up elsewheres. That said, the Diet Coke on a hot July day was indeed delicious. 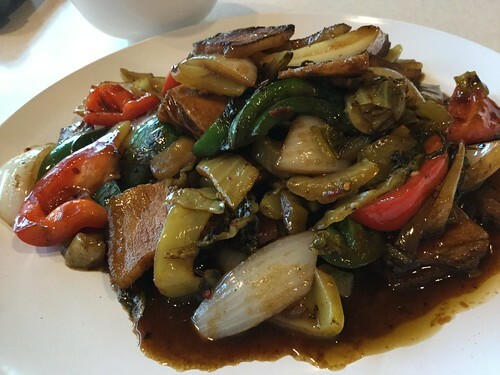 In a word: Savor the flavors. JM ate the mixed grill. Nichole ate the lamb korma. We split some cheesy naan. The bill was $44, or $22/person, plus tip. JM and Nichole gave Tandoori House an A- (see our grading rubric). Tandoori House, per secret Madison food ordinance, serves a lunch buffet and order-off-the-menu dinner. We went for dinner. The decor is a little spare (compared to the previous tenant, Maharaja, which with its darker decor and lower light felt a little homier than this) but the service was attentive and forgiving. 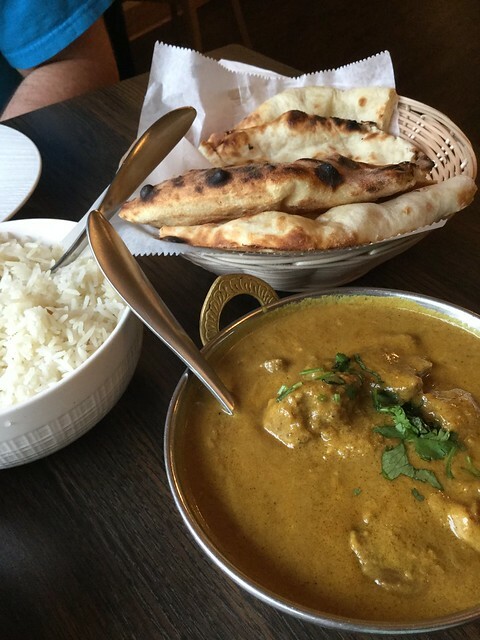 We started with cheesy garlic naan, which was truly above and beyond expectations. 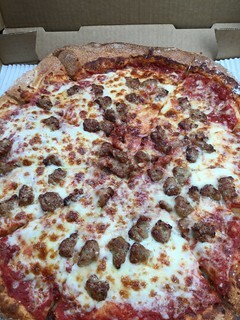 It was as good as any Neapolitan pizza, as far as super-hot-oven baked cheesy bready comestibles go. (We also ate the free basic naan, of course, which was just fine.) Nichole got the lamb korma which was delightful and saucy in the way that good Indian dishes need to be to afford a use for that rice. It was very tender and delicious. JM's mixed grill was the find of the trip, however. Four delicious meats like this, garnished with onions, would make any carnivore sing. 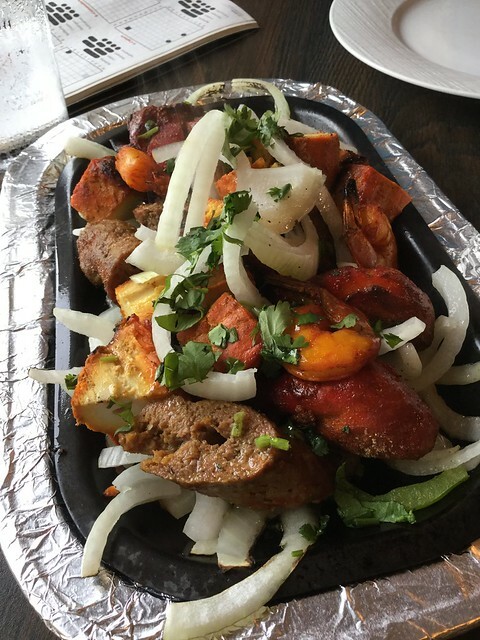 There were two kinds of chicken (roast and tandoori) as well as shrimp and sausage. No two bites ever got same-y and while Indian restaurant meats tend to be a little dry, in JM's experience, these where especially pert and flavorful, especially the sausage. The west side does not want for good Indian cuisine with Dhaba, Swagat, Haveli and Minerva, so it is hard to know how well Tandoori House will hold up in the crowd. But the flavors are tasty and the location convenient to the mall (and most people may be auto-pilotting Maharaja anyways). We wish them the best. In a word: Perfect for the Taipei personality in your life. JM ate the coffin toast. Nichole ate the cold sesame noodles. The bill was $24, or $12/person, plus tip. JM and Nichole both gave a Taiwan Little Eats an A (see our grading rubric). If we ever forget why we do this, a meal like the one we had at Taiwan Little Eats is the perfect antidote to that amnesia. See, what good came from the former Mad City Frites place, trying to offer southeast Asian small plates in competition with established rivals like the excellent Rising Sons Deli? What good, indeed! The menu is eccentric and delightfully all over the map. We ordered some sausage on a stick and scooped out some of the house brown mustard. These sausages were among the best we've had (really, only Sofra had better ones that sprang to mind, especially since RIP OSS). These were plump and filled with rich anise flavor but not in a way that drew comparisons to licorice. 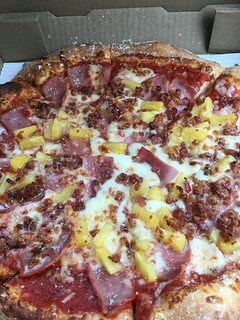 Each bite was a delight. 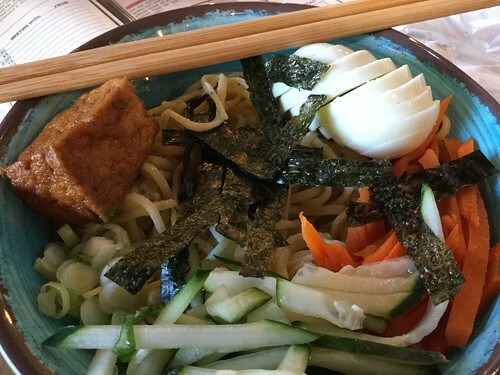 Nichole pulled up a bowl of cold sesame noodles which were worth losing your head for. These had great texture balance betwixt sticky and slippery. It came with a d6 of tofu, a neatly slice hardboiled egg (yum!) and a veg garnish that should be replicated often (nori, carrots, cukes and green onion). JM beat Nichole to the punch, however, by claiming dibs on coffin toast before we even arrived at the restaurant. 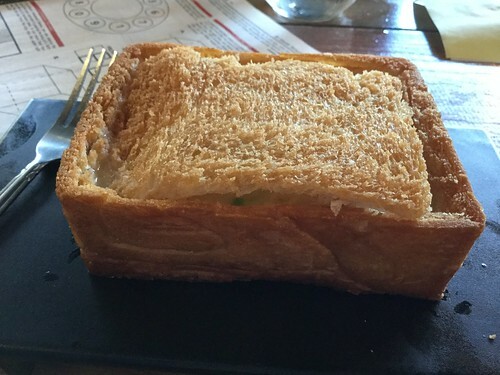 This dish bills itself as an Asian chicken pot pie, and in truth, this is a good comparison. If anything, that understates its awesomeness. The toast (as opposed to a pie crust) was buttery and perfectly browned. Removing the "lid" of airy bread reveals a creamy chicken filling loaded with savory veggies. The toast was amply buttered, as was the filling. Flesh eater, get yourself one of these stat! In terms of ambience, it's twee and pretty. A display of postcards and love letters from customers stands witness to many happy bellies. We split some gouda mac and cheese bites. The bill was $24, or $/person, plus tip. JM and Nichole both gave Tailgater a B (see our grading rubric). Tailgater in _________ opened just in time for us _________ it on this pass. It used to be called ________ and we had just visited it when doing letter ___ . The food was a little ________ than its predecessor and the increase in ________ meant that we were able to both see and enjoy our meals. Nichole stuck by her traditional order of _________ which came on wheat bread and was mighty _________. She also asked what the ____________ would recommend out of the __________ appetizer. We took the recommendation for gouda mac and cheese bites that were shaped like a ____________, but were __________ and fried to a perfect golden ___________. JM got the burger, which was a _____________ slab of beef. Given that all of their patties are _________ lb. at a minimum, you will you won't leave _____________. That said, the bun __________ stood up to the meat, becoming soggy and ___________ after only _____________. Of course, inverting the burger by flipping it ____________ worked OK. 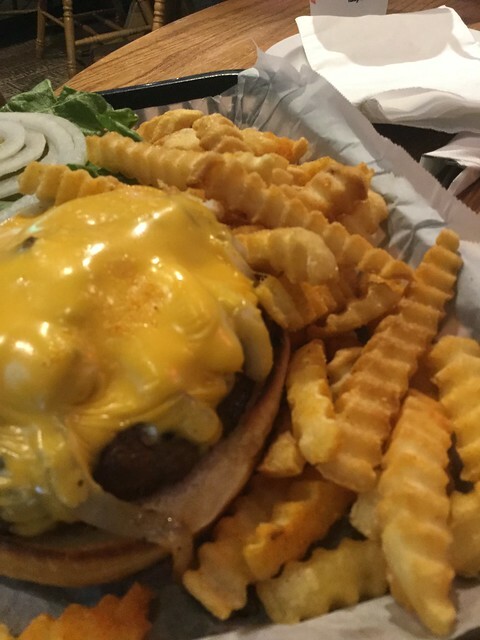 The fries were the size of __________, but were good enough. 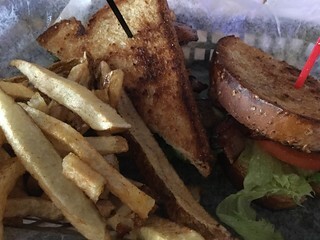 At this point in Madison A to Z, __________ may be expecting that reviews of basically the same __________ do not provide a lot of new detail to the dining scene. We would _____________ agree. And except for the ____________ gouda mac and cheese bites we don't see much difference between this and the other places in _____________. In a word: Kit-and-kaboodle noodles. 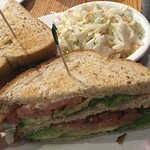 JM ate the pork belly with jalapeños and pickled cabbage. Nichole ate the beef, egg and tomato noodles. The bill was $28, or $14/person, plus tip. JM gave Taigu a B; Nichole gave Taigu an A- (see our grading rubric). Taigu is pretty great. JM got pork belly with jalapeños and pickled cabbage which only had one flaw (it seemed to be headed to another table yet landed on ours, more on this in a moment). Nichole's noodles with beef, egg and tomatoes was even better, showing off Taigu's impressive housemade, handmade noodles. The flame-grilled peppers were umami ne plus ultra. Of course, every plus has its minus and Taigu has a rather noticeable one. We arrived at a touch before 6, thinking maybe with a spot of luck, we could make a 7 PM activity. We settled up the bill at Taigu around 8:10. Just so you know, this good food takes time - the food here is quite good, maybe a little pricey, but good through and through. But you will wait for it, so bring the extended family, some old friends that you need to catch up with, or someone new that you want to get to know a whole lot better and just use the time for face-to-face interaction because you will likely be enjoying a nice meal out together for a while. In a word: Everything about this place should be put in "quotes." JM and Nichole ate some Taco Bell food. JM gave Taco Bell a C+; Nichole gave Taco Bell a C- (see our grading rubric). 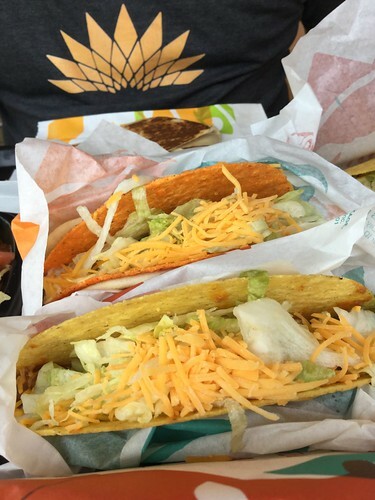 Taco Bell is not so much a restaurant as a commodity. How much you like it depends on three factors: how much money you have, how much time you have, how close is it. The less of any or all of these, the more you like it. We got a Crunchwrap, some tacos (including a Doritos loco one) and some nachos. Really, though, it all sort of tastes the same. Beans, cheese, lettuce, shell, cheese sauce, chips. 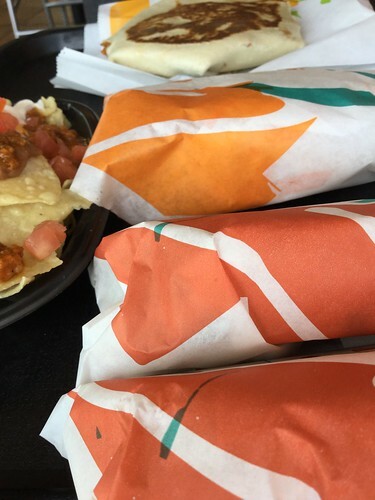 Taco Bell is good for when you don't have time to care (which makes the slowness of their drive-thru a little problematic). In a word: Good gosh almighty. JM and Nichole ate six mini cupcakes. The bill was $, or $/person, plus tip. JM gave Sweet Tea Cakes a B; Nichole gave Sweet Tea Cakes an A- (see our grading rubric). Sweet Tea Cakes is tucked into a strip mall near La Baguette. It is pricey in a Cupcakes A-Go-Go sort of way, but looks like it could do a real good wedding cake or other fancy-occasion baked good. The store case (spare with options the day JM stopped by) included mostly cupcakes and cake pops as the ready to order foods. 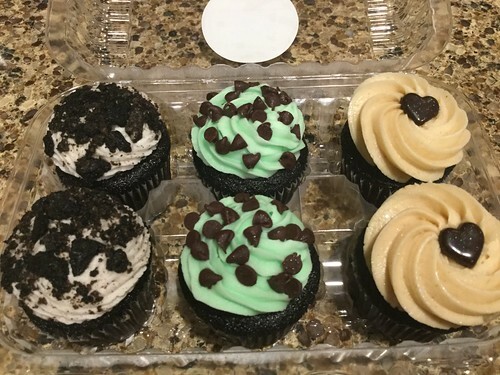 He picked up a set of six small cupcakes that comprised the 'chocolate package' (good choice, sir): two each of Oreo, mint, and peanut butter. We consumed the cakes within the weekend and found that they were all pretty good, but seemed like they should be under and not over a dollar a bite. We did not, in fact, pair them with tea, which may have been our downfall. The chocolate was good and cakes moist. Ranking them: Peanut Butter, Oreo, Mint. The mint was menth-y, not our favorite flav. We wouldn't rush back, but then, we rarely need cakes this fancy. In a word: Once you figure it out, it rocks. 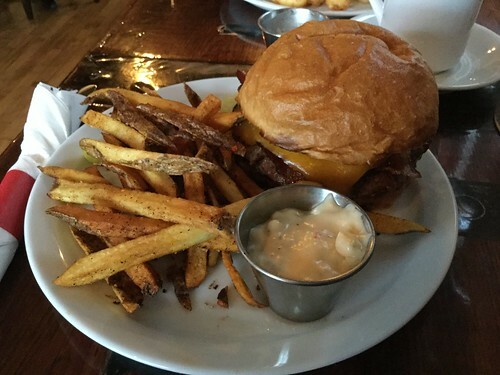 JM ate the BBQ bacon burger with fries. 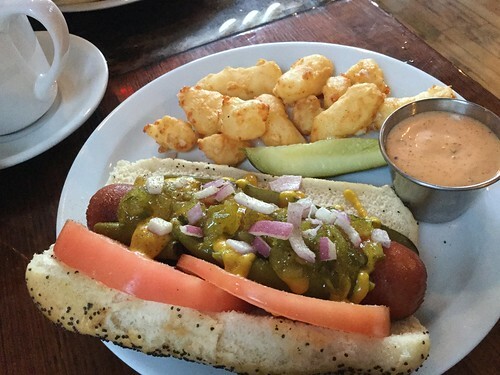 Nichole ate the tomato ginger soup, Chicago dog with curds, and a coffee. The bill was $31, or $15ish/person, plus tip. JM gave Sweet Home Wisconsin an A-; Nichole gave Sweet Home Wisconsin a B+ (see our grading rubric). Before we start on the food or the history or whatnot, let's start with the name. Sweet Home Wisconsin (and this becomes evident within 10 seconds of entering the place) is trying to tie into the classic late blues/early rock tune by Robert John (via Magic Sam via the Blues Brothers) called Sweet Home Chicago. This is a little weird for a couple of reasons. One: Sweet Home Wisconsin is trying to be a twist on the Old Fashioned model -- namely the genre of Sconnie dishes done right. Their twist is that there's a little bit of Chicago on the menu. [While the band Chicago may spring to mind here, and SHW does use an awful pop music framing structures, there is no reference to '25 or 6 to 4' all the way through to 'Look Away', et Cetera.] But this taste of Chicago just amps up the cognitive dissonance. You can do the Old Fashioned thing and lean in to Wisconsin cuisine or the Fib's thing and lean in to the Illinois stuff. But, Chicago dogs at Sweet Home Wisconsin. All we were was confused for a minute. Two: While Sweet Home Chicago may the first thing you think of, some might think rather of a different Sweet Home, namely Sweet Home Alabama. See, Sweet Home Chicago is Sweet Home + CITY while Sweet Home Alabama is Sweet Home + STATE. Some people may be thinking they're gonna get bratwurst change-ups with fried chicken and grits. Perhaps you should call it Sweet Home Madison instead to ensure that the pop music you're appropriating lands firmly in the milieu you desire? Also: A ton of Grateful Dead played during our meal. So much noodling, we thought it was a pasta place. Now that this whole wandering is out of the way, we can get to the actual food: which, and we don't want to understate this, is really good. 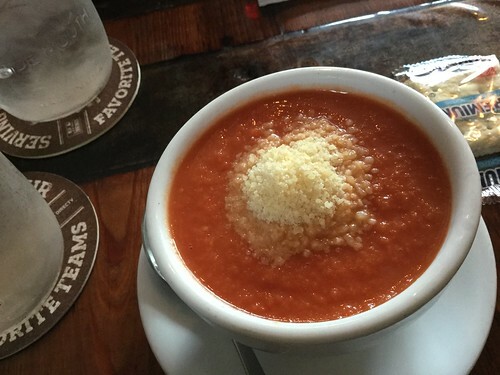 Nichole sampled their ginger tomato soup and found it very fresh and bright. The cheese curds, which, let's be honest, are good but are never going to top OSS curds, actually came very close to those pillowy delights. They were light and airy and came with a wide variety of sauce choices. JM's BBQ bacon burger was a perfect medium rare and the patty was clearly handmade. His fries, like all fries, can come plain or with a rub in addition to a sauce. Nichole got a perfectly made Chicago lacking only the relish that glows in the dark. This dog did come with relish; it just did not seem to require a hazmat suit. Pretty good dog. This location on Regent next to the Greenbush Bar continues to confound with its lack of parking and never quite enough tables (which is only exacerbated now that they have an even fuller bar). But the management is deeply rooted in this community as well as Madison's restaurant royalty, and the proof of the pudding is in the eating, and not in JM's pop music rants.